A Literary Lion Returns to a New, Still Dangerous, Kenya. (Foreign Desk) Marc Lacey. 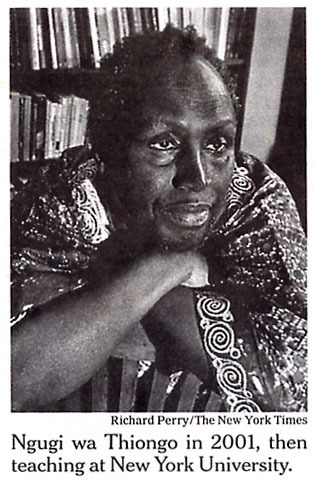 In ''Homecoming,'' a collection of essays published 30 years ago, Ngugi wa Thiongo assessed various forms of violence, some of which he considered justified to achieve social ends and some of which he dismissed as just plain thuggery. ''Violence in order to change an intolerable, unjust social order is not savagery: it purifies man,'' he wrote in defense of Kenya's sometimes violent struggle that led to independence from Britain in 1963. Mr. Ngugi, who returned to Kenya last month after 22 years of exile, is in the midst of a remarkable homecoming of his own, one that he says has inspired him but saddened him, too. He has been given a hero's welcome and has seen the political progress that Kenya has made. But Mr. Ngugi (pronounced GOO-ghee) has also experienced Kenya's new challenges -- violent crime and corruption chief among them. On Wednesday night, while Mr. Ngugi was resting in a Nairobi apartment between speaking engagements, four robbers barged in and brutalized him, his wife and a friend. The attackers raped his wife and stole cash and jewelry as well as Mr. Ngugi's laptop computer. One of the intruders burned Mr. Ngugi's face repeatedly with a cigarette. So brazen was the attack, some Kenyans have speculated it might have been carried out by former enemies. The attack on Mr. Ngugi, who remains hospitalized, tainted what had been a joyful return to his homeland. Because the government had banned his work from bookstores and schools, Mr. Ngugi's writing has been better-known elsewhere in Africa than in Kenya. But from the moment he arrived at the Nairobi airport on July 31, Mr. Ngugi, 66, has been swarmed by well-wishers. Mr. Ngugi's politically charged writing documented Kenya's repressive days and chronicled the country's difficult transition from colonialism to self-rule. In 1977, he wrote ''Petals of Blood,'' which portrayed post-colonial Kenya in a harsh light. Later that year, his play ''Ngaahika Ndeenda'' (''I Will Marry When I Want''), written with Ngugi wa Mirii, was performed in an open-air theater in Limuru. It dealt with the inequalities and injustices of the time and prompted the government led by Kenya's first president, Jomo Kenyatta, to demolish the theater and imprison Mr. Ngugi. When he finally won release, the government barred him from returning to his teaching job at the University of Nairobi or from teaching at other educational institutions. But it could not stop his pen. In 1982, while promoting ''Devil on the Cross'' in London, he learned of plans by President Daniel arap Moi to arrest him again, and he decided not to return to Kenya. From overseas, he continued to rile the men he contended were ruining his beloved Kenya. His novel ''Matigari,'' published in 1986, led the government to issue an arrest warrant for the fictional man in the book who was roaming the countryside in search of justice. When officials could not track down the character, Matigari, they banned the book. Years ago, Mr. Ngugi vowed not to return to Kenya until Mr. Moi had left office. That happened in December 2002 when Mr. Moi agreed to abide by term limits, and his handpicked successor, Uhuru Kenyatta, lost the election. The opposition united behind Mwai Kibaki, who won. Mr. Kibaki's Kenya has made progress, but crime is still out of control, with a huge rich-poor divided and a less than effective police force. Mr. Ngugi has said, however, that the Kenya of today is not the same place he left. For one thing, Kenyans no longer have to look over their shoulders for informers when they talk politics. ''I have not sensed that fear,'' he told The East African Standard, a Nairobi daily, in a recent interview. Despite the awareness that Kenya still has a long way to go, Mr. Ngugi, who now teaches writing at the University of California, Irvine, has had many happy times during his stay. He and his wife, Njeeri, knelt and kissed the Kenyan soil when they arrived. He lectured at the University of Nairobi. Wherever he went, he spoke to ordinary people, using his native language and feasting on their delicacies -- roasted goat ribs, for instance, and irio, a mashed mixture of potatoes, corn and beans.